One of the top hurdling programs in the state of Virginia is headed to Flo Golden South on May 19. 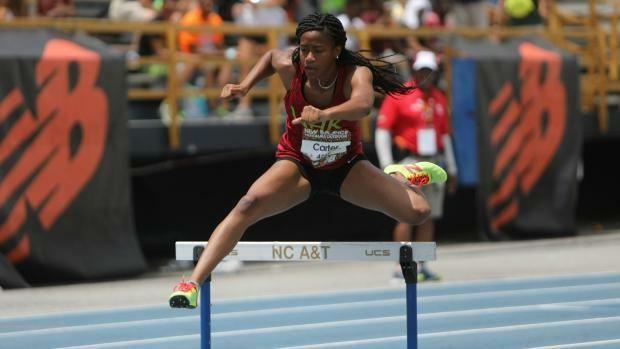 Nansemond River, a hurdle powerhouse located in Suffolk, Virginia, will bring a strong contingent of its best athletes to the annual event held at First Academy in Orlando, Florida. Kori Carter, a multiple indoor and outdoor state champion, will headline the squad known as Team WAR as its looks to prepare for championship season in June. Breakdown: Carter is the big name here, and she could compete in a variety of events, including the 200m, 100mH and 400mH. With a qualification to the World U20 Championships on the line in June, Carter could likely eye up a spot in either hurdle events, so her performance at Golden South could give her an indication of just how ready she is. Her PR is 13.56 (+1.9) in the 100mH and 1:01.17 in the 400mH. Carter has also split 24.36 seconds in an open 200m.